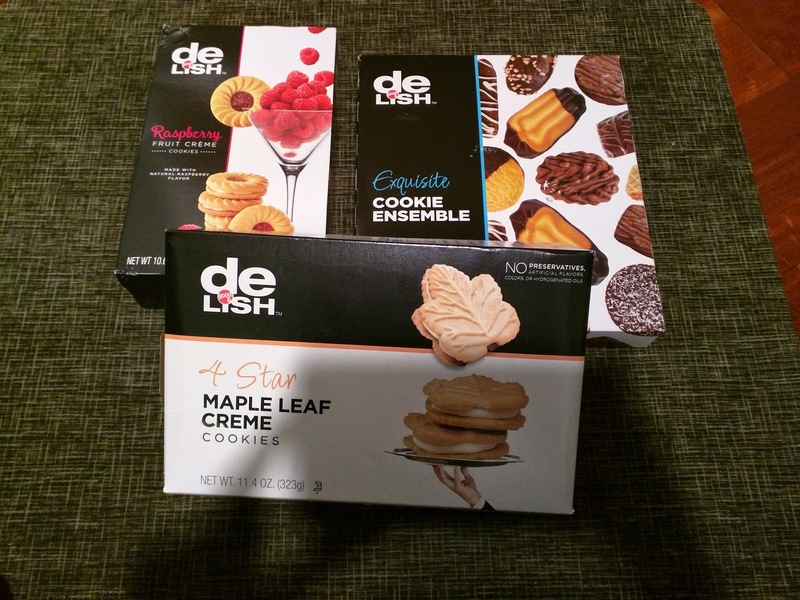 Snack Foods Fri: That time I won a box of products from Good & Delish. 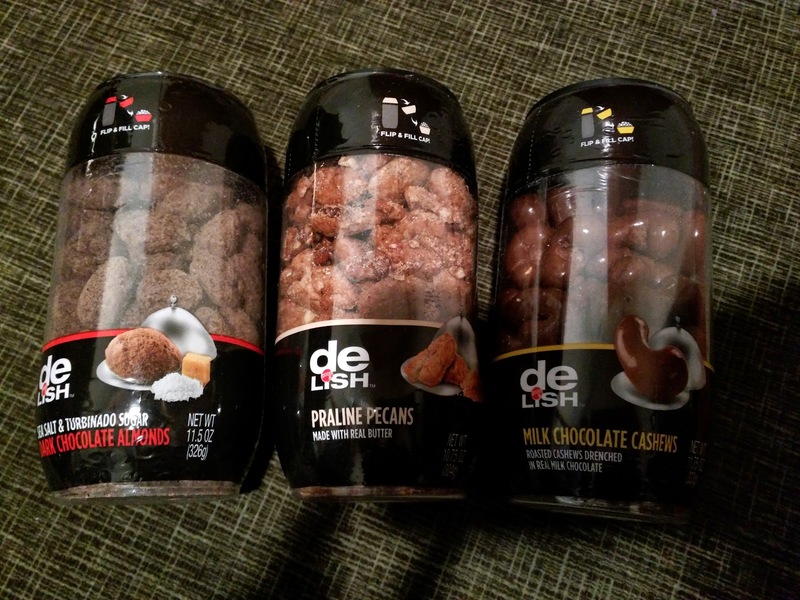 One day, I won a Twitter contest for Good & Delish, the premium house brand from Walgreens. Yes, really. When I received a direct message asking for my (physical) address, I almost thought it was a scam. But, the sender was @walgreens, it must be real, right? So I gave my address, not really sure what to expect. A few days layer, a box showed up at my door. I still wasn't entirely convinced this was real. And then I opened the box to discover a serious bounty. 6 containers of candied nuts, 5 boxes of assorted cookies, 3 boxes of chocolates, gummy candy, and a stocking full of chocolates. Um, wow! These are all things I like! Good & Delish is the premium house brand at Walgreens. I'm no stranger to Walgreens products, as you may recall from my reviews of their other, lower-end, house brand, Nice!, which has shockingly good glazed honey buns (once you warm them up that is) and mediocre chocolate. Neither line carries any Walgreens branding on the packaging, so unless you knew this is made by Walgreens, you likely wouldn't even notice. The Good & Delish brand has basically ... every snack food imaginable, but I lucked out, and they sent me basically only sweets. Most of the bounty was fairly mediocre, but, there were some decent surprises. Plus, um, I got a free box of stuff! 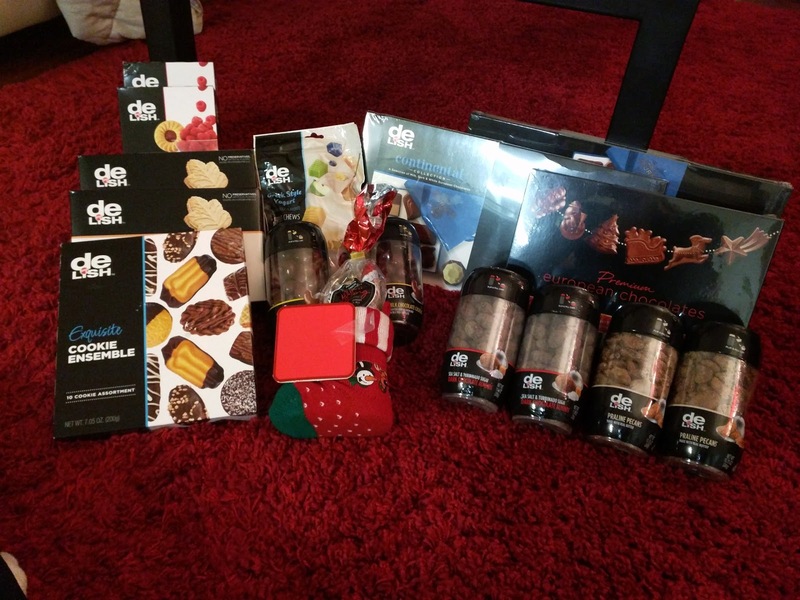 The Good & Delish product line has a ton of chocolate products. I won't enumerate them all here, but they make all sorts of chocolate bars, chocolate covered nuts, fruits, cookies, clusters, etc. 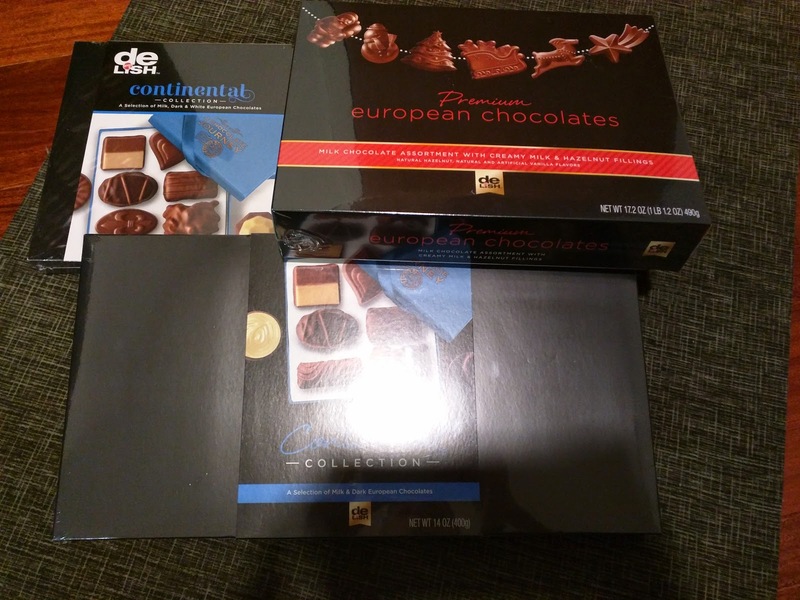 I received 3 different boxes of assorted chocolates. These were not good items. Each box is plastic wrapped, and then has a sleeve surrounding the box. 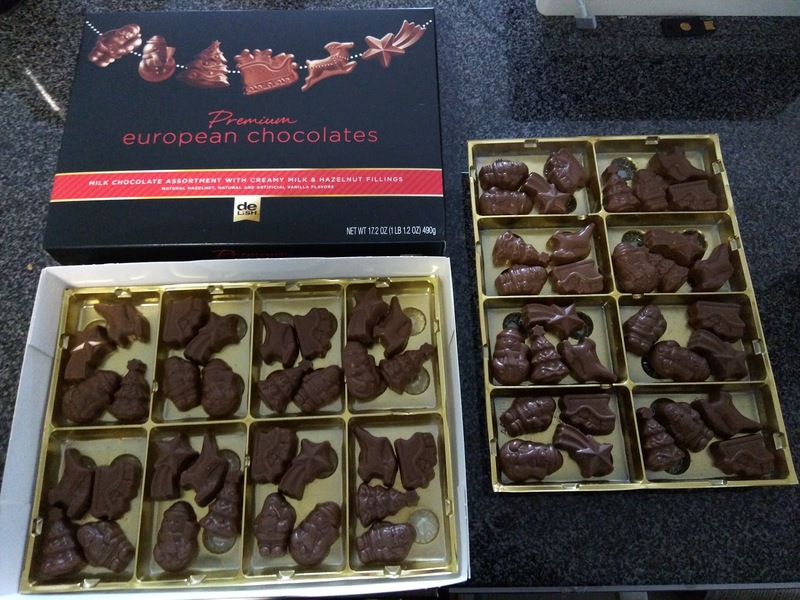 I started with the "Continental Collection", a box containing 10 different types of "milk and dark European Chocolates", 4 of each, 14 ounces total. It was a hefty box. The chocolates were arranged attractively, alternating colors and shapes. Someone clearly put thought into the layout. Inside the box cover was a guide to the chocolates, but it was rather ambiguous, just hand drawn pencil style. From the sketches, I wouldn't have realized that the milk chocolate hazelnut was actually the white topped one, but luckily, the back of the sleeve contained a second, full color guide. I'll review each chocolate in similar pairs. Ojan's overall review: "There are times when I'd be in the mood for this type of candy". Note the word candy, not chocolate. He also immediately declared that I certainly wouldn't like these. He was right. Nougat Duo(R): An attractive two-toned piece. Again, nougat? I have no idea what the "duo" of flavors were supposed to be here, I didn't taste anything notable. Chocolate Roasted Hazelnut. Milk Chocolate Hazelnut. 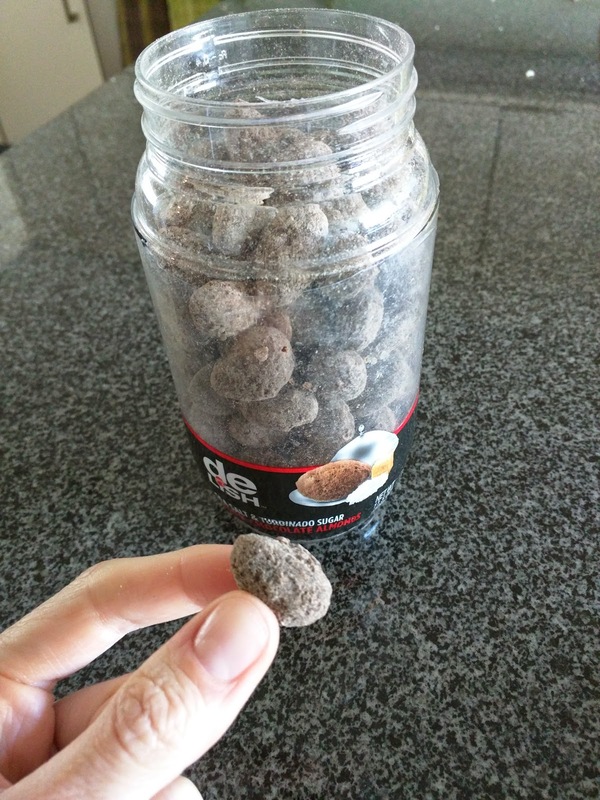 Chocolate Roasted Hazelnut(L): I somewhat expected a whole hazelnut to live inside of this, I'm not sure why. It didn't have one. Instead there was a dark chocolate top layer, a milk chocolate layer, and a almost creamy center that had a slight hazelnut flavor. I'm not a lover of hazelnut, and this didn't do anything for me. 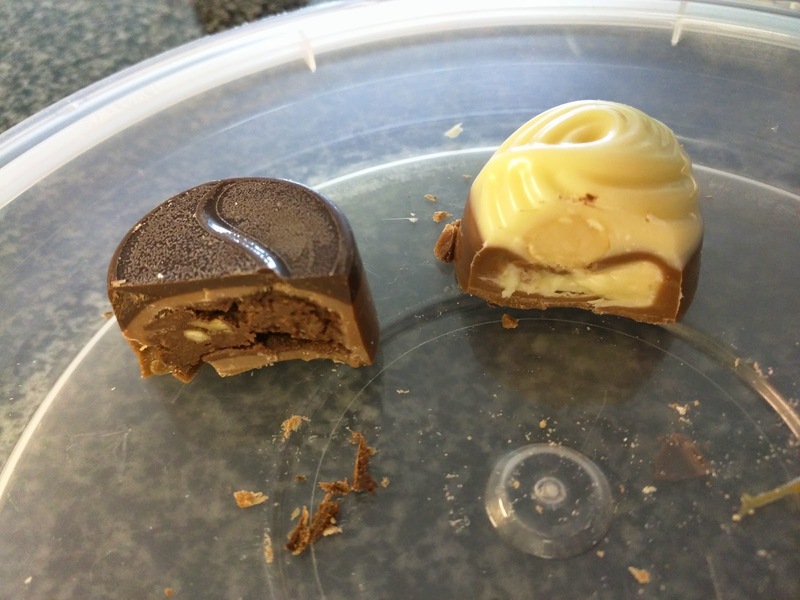 Milk Chocolate Hazelnut(R): I was confused why it had white chocolate on top. Wasn't this the milk chocolate hazelnut? 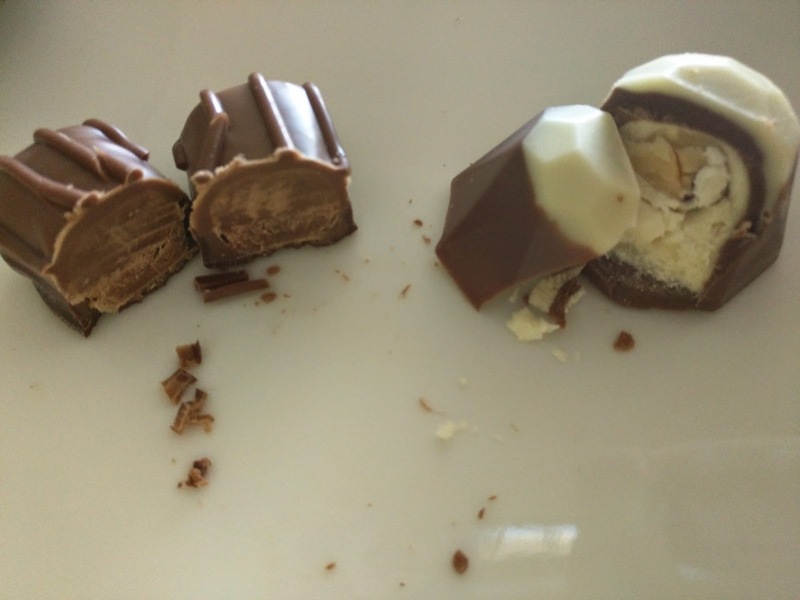 The white chocolate was waxy and truly awful, the sort of chocolate that gives milk chocolate a very bad reputation. Vanilla Stick(L): I wasn't sure what to expect from this one, what is a vanilla stick? It was ... another thick caramel on the inside. It didn't taste any more vanilla flavored than the others. The aftertaste was bad. Toffee Crisp(R): This was certainly the one I was most looking forward to. I like toffee, I like crunchy things. I was surprised when I cut it open and found that the crispies were just on the outside, and, well, they were like rice crispies, not toffee. I guess the toffee was the thick caramel inside? Very disappointing. 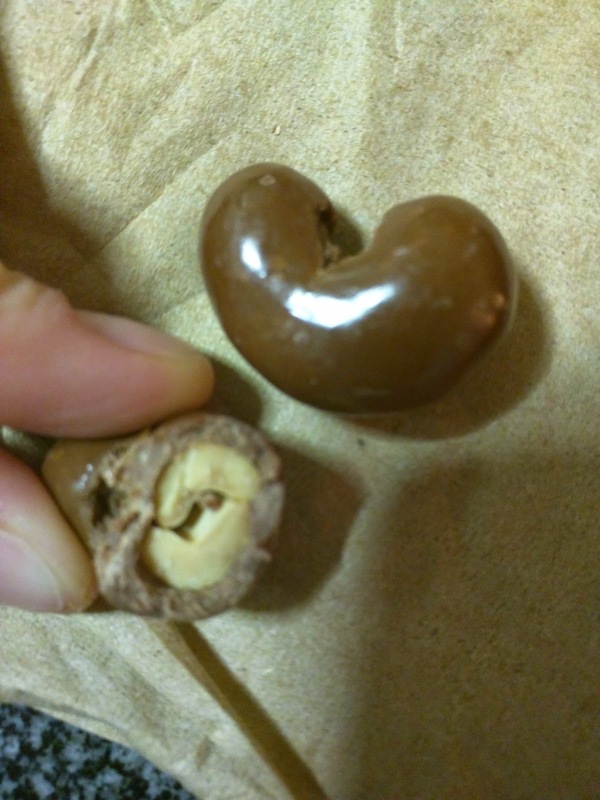 Soft Caramel(L): At least this had a cute heart shape. It is the first one Ojan went for. 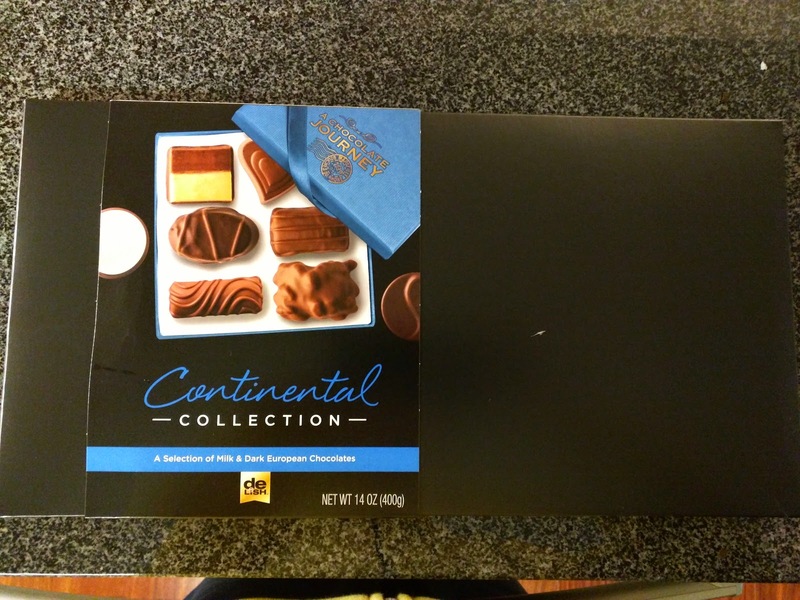 He took one bite and said he wasn't really interested in this box of chocolates, and that he didn't want another. Uh-oh. I actually thought this was the best of the box. The caramel was gooey, slightly buttery. The milk chocolate shell had a nice snap to it. I didn't necessarily want another, but, it wasn't bad. 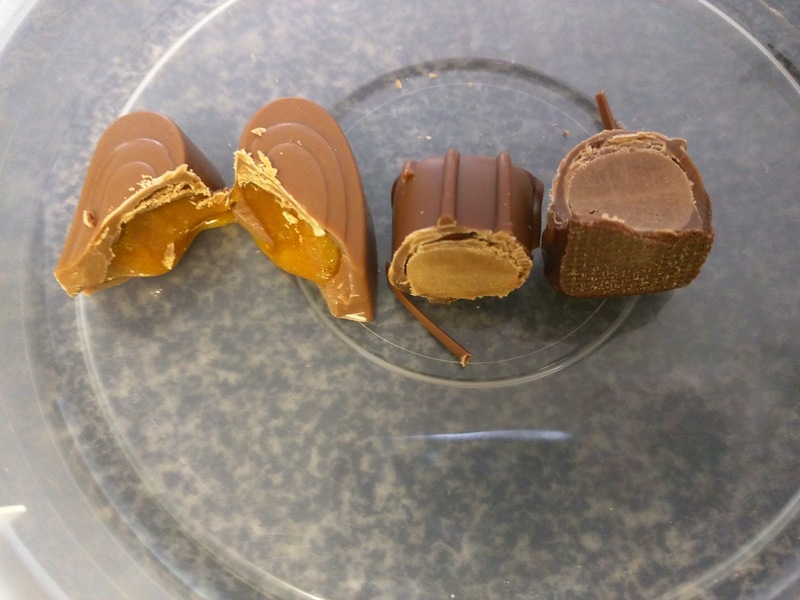 Toffee Caramel(R): Ojan did eventually try another, the toffee caramel. He said that someday he might be in the right mood for another one of these, comparing it to the same quality level as eating a Twix. 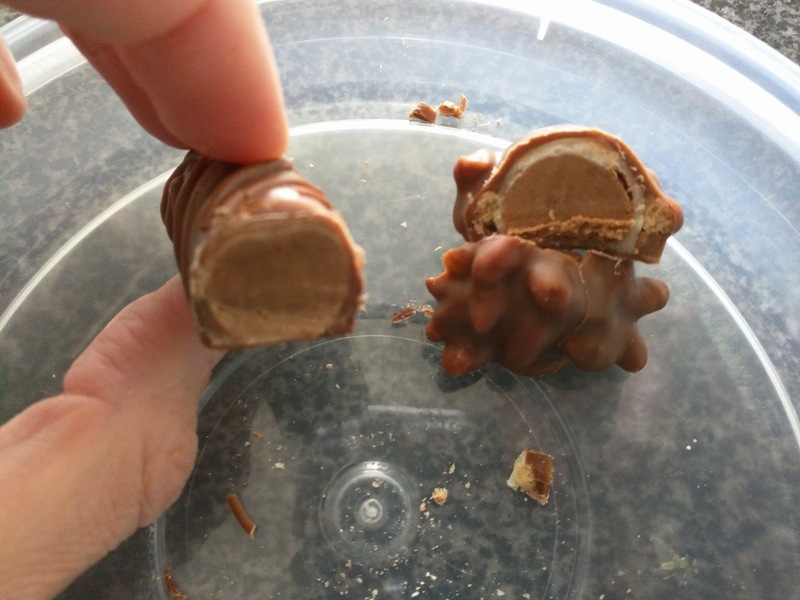 The toffee had a decent chew to it, but the chocolate had a strange bitterness to it. I could see how Ojan compared it to a Twix though. Not really my thing. These were the worst of the box. The "cream" component of each was a crumbly white filling, chalky and really off putting. The orange flavor was identifiable as orange at least, but, in a cough syrup sort of way. The strawberry was equally awful, it tasted remarkably fake. "Milk, dark, and white European Chocolates." 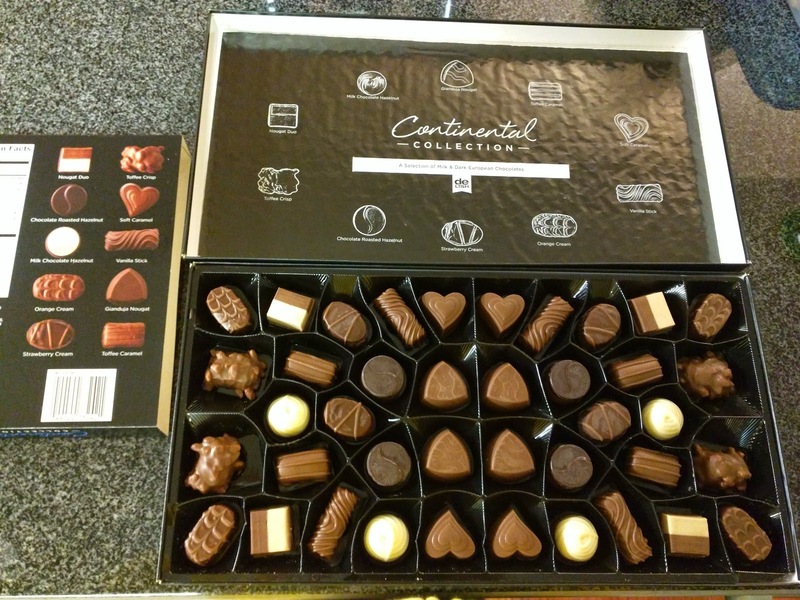 Next up, another box of assorted chocolates. 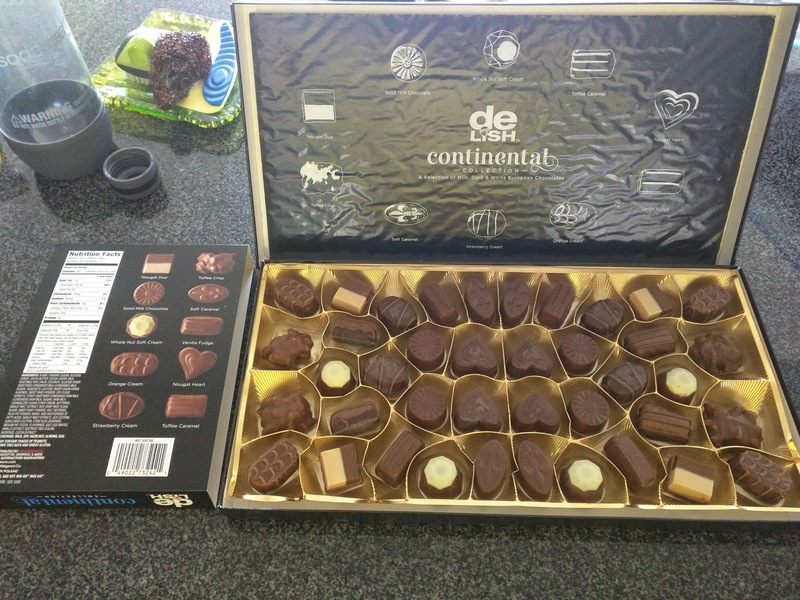 This assortment was ALSO called the Continental Collection. It also contained 10 different types. 6 were the same 4 were swapped out from the other collection. I'll only review the new additions this time, again in pairs. Nougat Heart. Solid Milk Chocolate. 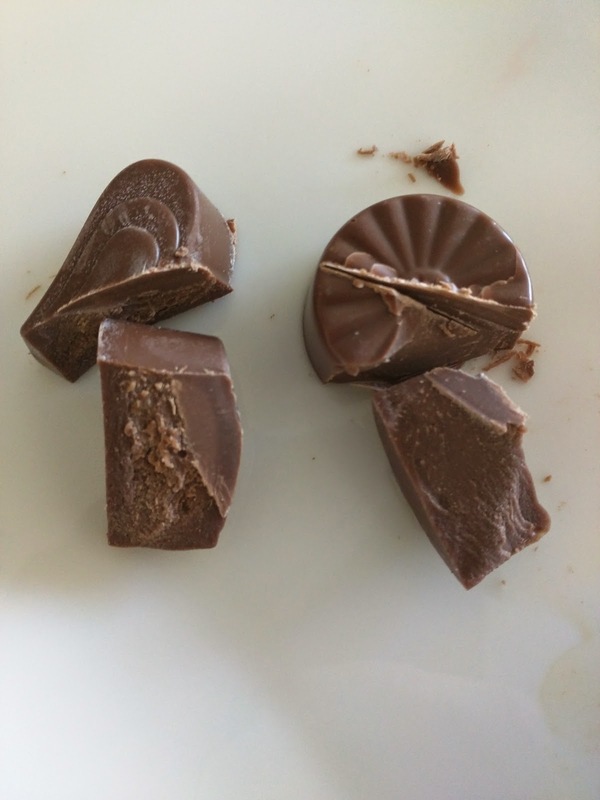 Nougat Heart(L): Milk chocolate surrounding a slightly different style of center. Not what I think of as nougat, but, it had a slight hazelnut flavor perhaps? I guess that is a style of nougat, but not the soft, white style I'm used to. Solid Milk Chocolate(R): This was about what you'd expect, just basic mediocre milk chocolate. It wasn't bad, but it certainly wasn't a quality item. Vanilla Fudge. Whole Nut Soft Cream. I just really don't understand the naming of these chocolates. Vanilla Fudge(L): The "vanilla fudge" was a slightly chewy center, almost like a caramel. Not what I think of as fudge. Not vanilla flavored. Mediocre quality all around. Whole Nut Soft Cream(R): There was nothing soft, nor creamy, about it. 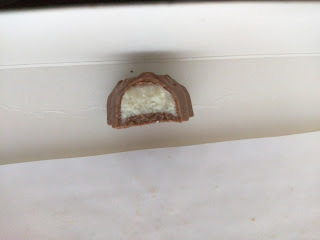 Inside was an almond, surrounded in a chalky white layer, with milk chocolate, and a white chocolate shell on top. The "soft cream" was really quite gross. Neither of these were good. "Milk chocolate assortment with creamy milk and hazelnut fillings." My final box of chocolates was a holiday themed assortment, a mix of 6 Christmas themed items: Santas, snowmen, sleighs, shooting stars, Christmas trees, and reindeer. They came sorta randomly grouped together. I didn't really know what to expect for the fillings on these. Whole hazelnuts? Ganache? I started with a shooting star. It was a milk chocolate shell with milk chocolate inside. The chocolate both inside and out wasn't very good, somewhat plastic and stale tasting, while also being bitter and boring sweet. Yeah, not good. 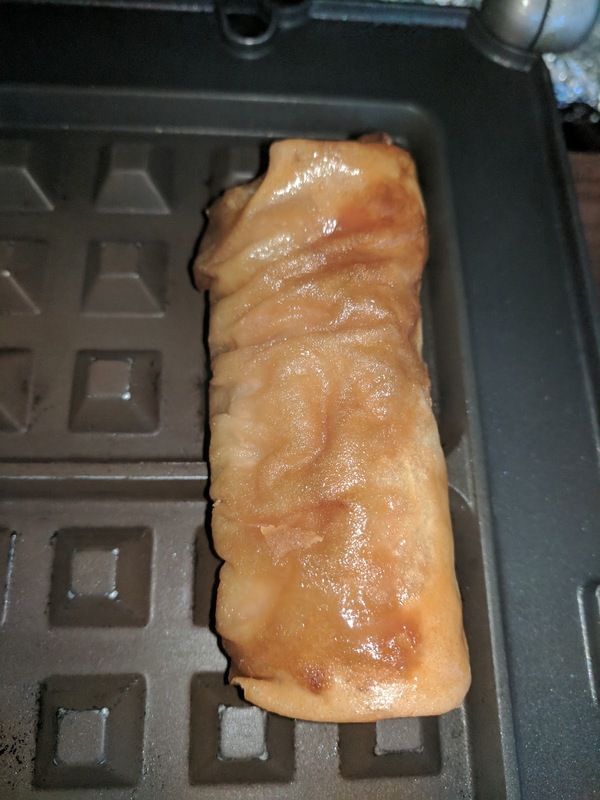 The filling was at least smooth and soft? Next, I went for the tree. It had white inside. What was the white? I have no idea. Was it hazelnut? It didn't taste anything specific. The filling was a bit sweeter than the dark filling, but I certainly couldn't identify it. 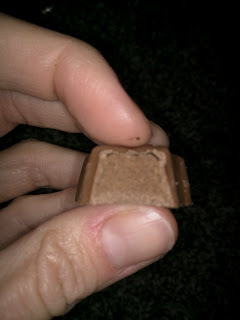 Like the milk chocolate one, the soft, smooth texture was nice. It also turned out that shape had nothing to do with filling. The next 4 chocolates I tried all had the white filling. Another shooting star had white filling. I'm not really sure how they were broken down by flavor. The Good & Delish line of cookies is fairly extensive. In addition to the 3 varieties I received, they also offer oat & cranberry, butter cookies, shortbreads, macaroons, bite size chocolate chip, and some very temping chocolate and caramel truffle cookies. 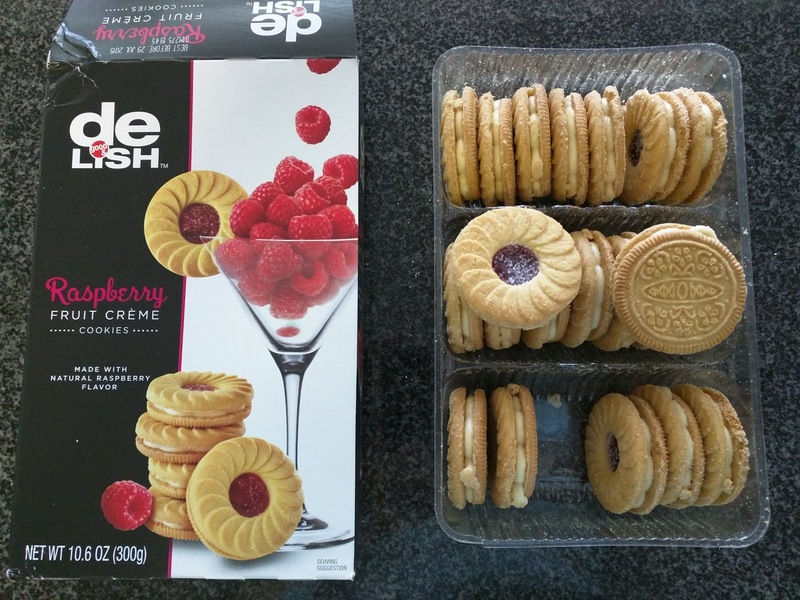 My box of goodies included a mixed assortment, and two types of "creme" cookies. The creme cookies turned out to be really quite decent. "These cookies are delectable combinations of buttery flavored cream and raspberry jelly sandwiched between our delicious cookies." 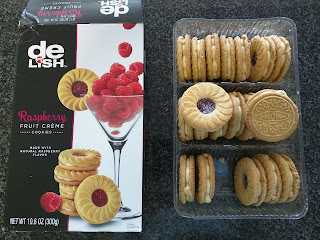 Since I don't really care for cookies, and clearly not packaged ones, I didn't even expect to take a second bite of one of these. Yet, I did. They weren't awful. I mean, for what they were, they were perfectly acceptable. The cookies were sweet, but not any real flavor in particular. One side was solid and printed with a design, the other had a hole in the center. Slightly crumbly. Inside was the "buttery flavored cream", which was again just sweet. Not buttery. It was the exact same texture as the filling inside Oreos, although, less sweet than that filling actually, and a slightly different flavor. These two components reminded me of Vienna Finger sandwich cookies. I haven't had them in years, so I don't know how accurate this is, but, that is sorta what they reminded me of. In the center was a dot of raspberry jelly. It had a strong raspberry flavor, but was really sticky, tacky. I didn't like it much. So, overall, not awful. If I liked packaged cookies, I'd get them again. They also make a lemon flavor, but I only received raspberry. 4 Star Maple Leaf Creme. "These cookies are filled with smooth maple creme, which complements its crispy, delicious, wafer base. Made with real maple syrup and natural ingredients, this unique cookie is a delicious snack." Well, huh. Again, I don't like cookies, particularly hard cookies, particularly packaged cookies. I again thought I'd take a bite, review my review, and move on. But these were really decent. 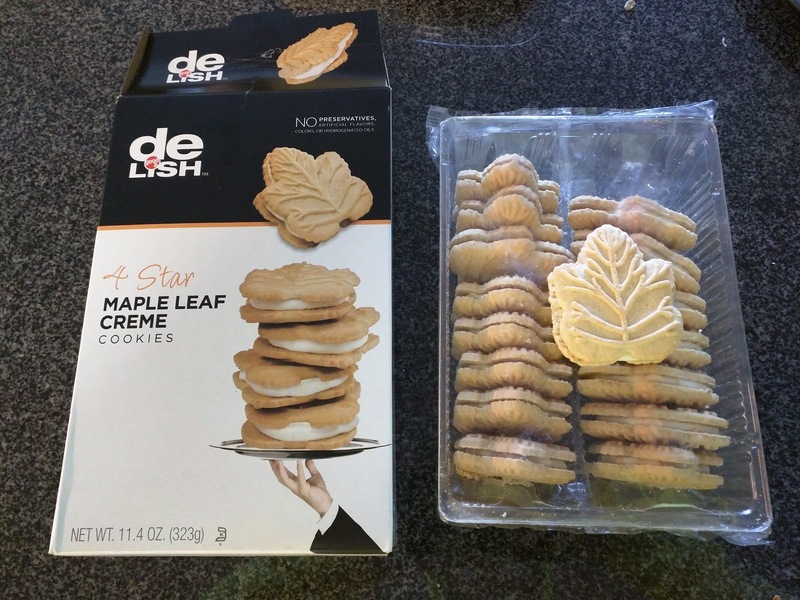 The cookies were softer than I expected, with a light maple flavor. The filling was delicious, super maple-y. Yes, it was generic package cookie cream filling, but ... it tasted good. My only complaint is that there was a lot of cookie and not much cream. I preferred having one open-faced, just half a cookie with all the cream. Either they need "Double Stuffs", like Oreos, or, they need to reduce the cookie part somehow. If you like maple and packaged cookies, I recommend these. 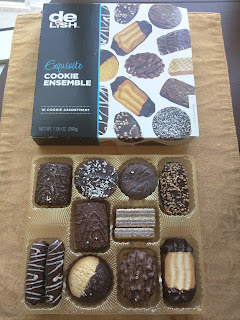 "An assortment of 10 different cookies, all made with pure Belgian chocolate." 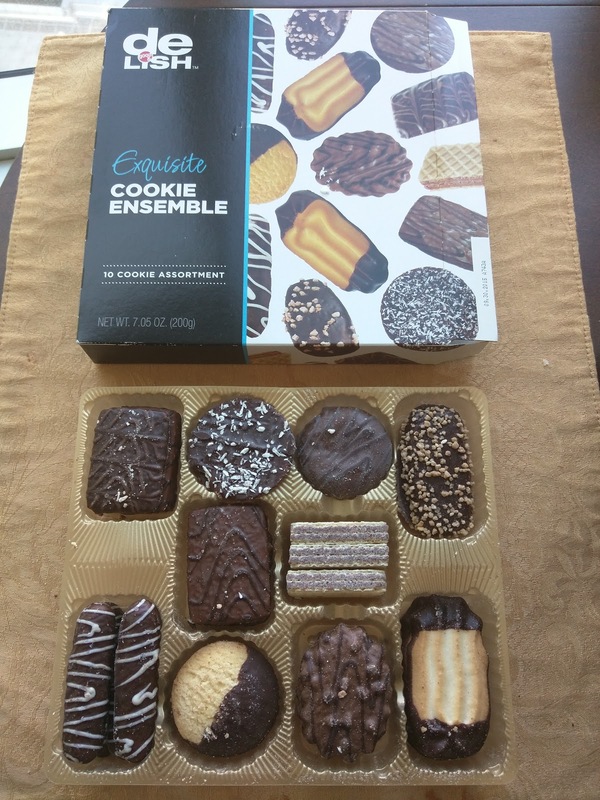 The last box of cookies I received was the fancy sounding "Exquisite Cookie Ensemble". The names of each also sounded quite classy. The cookies looked a lot like Pepperidge Farm or what you'd find in an airline lounge. Not my style of cookies, not that I really like any cookies, but, hard, packaged cookies are certainly at the bottom of the barrel for me. Still, I tried them. For you, dear readers. They ranged from highly mediocre to quasi acceptable. "Rich crispy cookie dipped in milk chocolate decorated with fine dark chocolate drizzle". The cookie was more like a graham cracker, a dark color, not shortbread like the others. But crispy. The chocolate coating was ok.
"Crispy thin pastry covered with chocolate and coconut flakes". A very thin, boring shortbread style cookie. Chocolate coating was ok, I liked the crunch from coconut, but, quite boring. "Rich hazelnut cream cookie covered with fine chocolate and dark chocolate decoration." I know I tried all the cookies, but, I seem to have lost my notes for this one. "A crunchy indulgence, crispy shortbread covered in luscious dark chocolate and sprinkled with nut brittle" . The cookie itself was again quite boring, the chocolate mediocre, but I did like the crunch from the nuts. My second favorite. 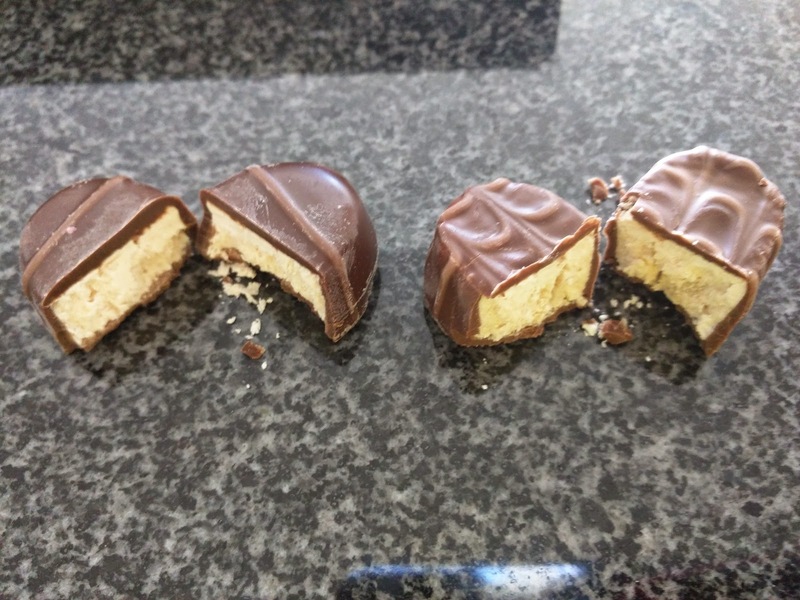 "Rich shortbread cookie with both ends dipped in smooth dark chocolate". Basic shortbread cookie, not very buttery, soft. 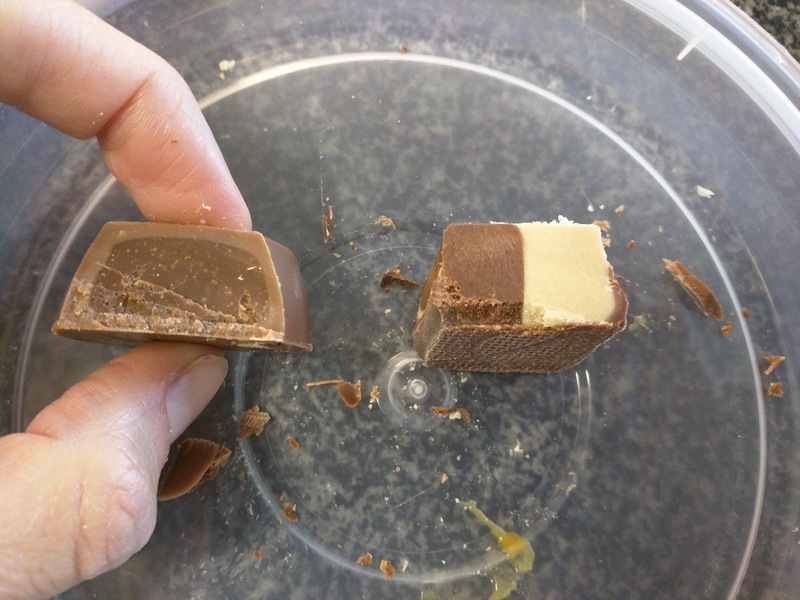 The ends and bottom were coated in chocolate, it seemed more like milk than dark to me, but they say it was dark chocolate. Not interesting. "Fine biscuit enrobed on both sides with milk chocolate and fine dark chocolate decoration". This biscuit itself was a darker color than any others, almost looking like it should be a chocolate biscuit, but it didn't really taste chocolate. It had some texture to it, that was interesting, but, no real flavor to this. "Round sunny biscuit enrobed in super-fine dark chocolate". Surprisingly good. I have no idea what a "sunny biscuit" is, but, it was better than the dark "crispy cookie" and shortbreads. My favorite. "Crispy fingers dipped in dark chocolate and decorated with white chocolate drizzle". 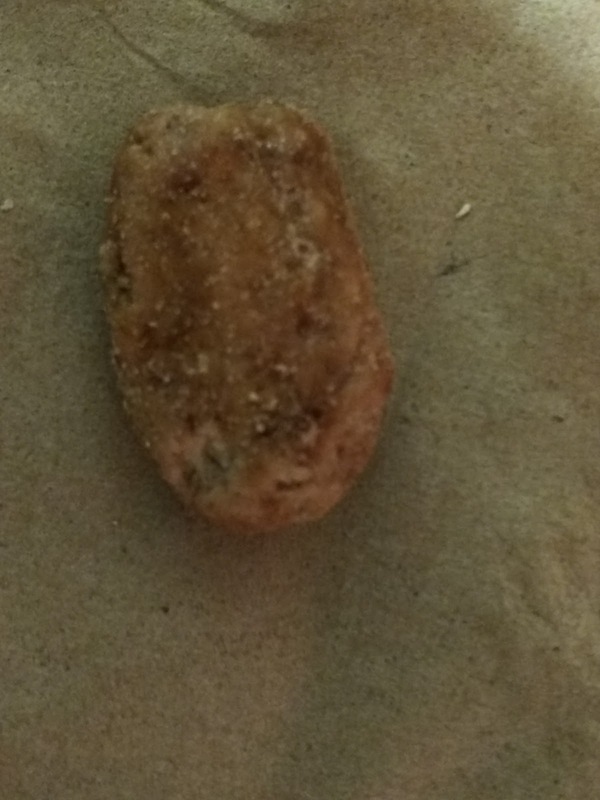 Just a crispy cookie, mediocre chocolate, nothing interesting here besides the shape. "Rich crispy cookie dipped in dark chocolate decorated with fine milk chocolate drizzle". Just like Symphony, a crispy dark cookie, just with dark chocolate instead of milk chocolate. I liked this slightly more due to the dark chocolate. "Crispy wafer filled with milk chocolate cream". This was the one I expected to love, since I like wafer cookies. But, the wafers weren't particularly good, and chocolate cream wasn't creamy. The Good & Delish line has a slew of packaged nuts, ranging from basic roasted nuts (cashews, macadamias, pecans, almonds, pistachios, or mixed in several varieties), to chocolate covered nut "Gems", to coated nuts. I luckily received the candied nuts and the chocolate coated ones - yes! Exactly what I would of picked, rather than just plain roasted ones. We had mixed success with these. "Roasted cashews drenched in real chocolate"
These were exactly what they claimed to be. Whole cashews, fine cashews, but just cashews, smothered in milk chocolate. The nuts were fine, although a bit bitter. The chocolate was fine, but very basic milk chocolate. The ratio of chocolate to nut seemed way off to me, as I mostly just tasted chocolate, but I think that is what they were aiming for? There were some pieces that I actually questioned if they even had a nut in them, as all I tasted was the mediocre milk chocolate. I don't tend to really like cashews however, and just wanted them to be just about any other nut. Nothing wrong with these, for sure, but to me, meh. Other guests I offered these to slowly nibbled on them over time, but, no one raved about them. The praline pecans were the ones I was most excited for. I love pecans. I love praline ... butter and sugar? Yes! The bottle even proclaimed "made with real butter". The nuts were mostly halves, although there were some chunks. All generously coated. I eagerly bit into the first one. Eww. I can't explain what was wrong with these. I really, really didn't like them. I tried several, just to make sure I wasn't going crazy. They tasted more like walnuts than pecans, but, they were obviously pecans. They had a strange bitterness to them. They tasted ... not burnt exactly, and not stale exactly, but almost rotten? I really don't know how to explain it. The sugar coating, was generous, but didn't save them. My notes said very clearly: "Wow. Do not want more of these." Nor did anyone else I offered them to. I even brought them to my office, where they went unconsumed. That NEVER happens! Dark Chocolate Almonds Sea Salt & Turbinado Sugar. I saved the best for last, unknowingly. These were the winner of the batch, and actually good. Almonds, coated in dark chocolate and a sugary, crunchy, candied coating. 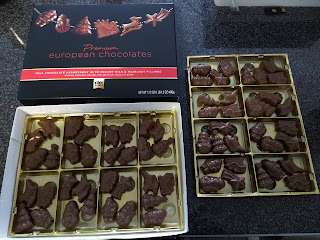 I liked how crunchy they were, and the dark chocolate was more complex than the milk chocolate on the cashews. The ratio of chocolate to nut was also better than with the cashews; the chocolate accented the nuts, but didn't overwhelm. I would have preferred more salt however, but for those who aren't used to salt with their chocolate, I could see this being a good intro. For me, I had to eat a whole handful at a time to really taste the salt, a single nut didn't have enough. We easily finished off the jar of these. And finally, some candy. I received only a single candy item. It was not good. Greek Style Yogurt Fruit Chews. Fruit chews. These sounded promising, although I was a bit skeptical of the "Greek Style Yogurt" part. 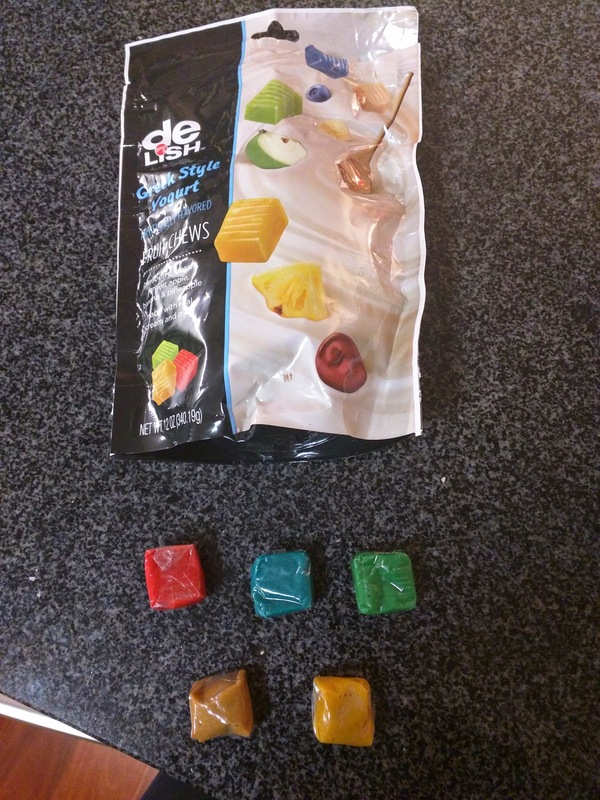 The chews came in 5 flavors: cherry, blueberry, green apple, banana, and pineapple, each individually wrapped in plastic. Plastic is a theme here, as it is all they tasted like. You could smell the flavors, particularly the blueberry, but in terms of taste, there was nothing besides plastic. Perhaps sweet plastic, but plastic nonetheless. The chew quality was decent, like a soft taffy, but, I really didn't like these. Others were intrigued by them, and went back for a second or third try, saying they almost liked them, but in the end, no one was thrilled with them. Ice cream. While I don't necessarily review it often, I actually follow a pretty strict "ice cream a day keeps the doctor away" mantra. Wait, that isn't a mantra? Well, it is mine! And to be fair, sometimes it is froyo. My office has a soft serve machine, with DIY toppings, that I visit at least once a day, Mon-Fri. My freezer is always stocked with regular ice cream, ice cream novelties, and more. There was a time when I won 32 pints of ice cream (yes, really). But much like cookies, I don't actually generally consider ice cream a dessert itself (unless it is soft serve froyo, in a bowl, with tons of toppings, or soft serve ice cream, in a cone, with sprinkles, on a hot summer day). But I don't just eat a bowl of hard ice cream, even with toppings, even as a sundae. For me, ice cream is a pairing, e.g., it is what I have on the side with my warm fruit cobbler. But anyway, yes, I eat a lot of ice cream. 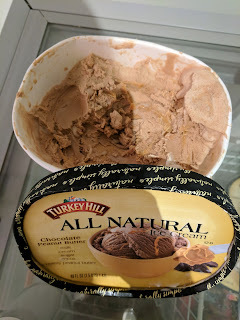 Turkey Hill is not a local, artisan, special ice cream shop. They are just a national manufacturer of ice cream (and, ice tea? ), owned by Kroger supermarket, located in Pennsylvania. Turkey Hill Dairy started in the 1930s, just a farmer selling milk to his neighbors, and expanded to making ice cream in the 1950s. They started distribution through stores in the 1980s, expanded rapidly, and were taken over by Kroger, although they say the family stayed heavily involved. I'm a little surprised I haven't seen Turkey Hill before now, as they are the largest manufacturer of refrigerated ice tea (so random! ), and the 4th largest ice cream producer (after Nestlé (which includes (Häagen-Dazs and Mövenpick)), Unilever (which includes Ben & Jerry's), and Wells' (Blue Bunny), all of which I've reviewed before. Maybe I just haven't noticed before? 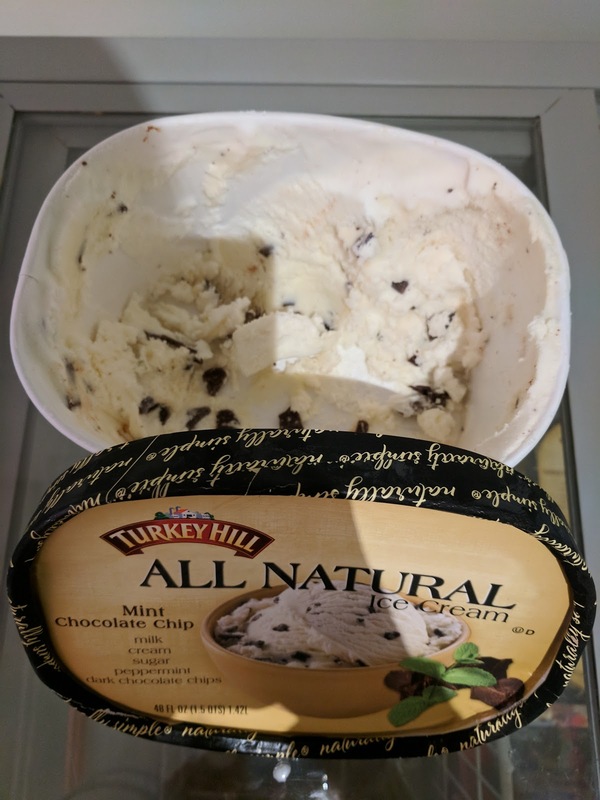 Turkey Hill produces >60 flavors of frozen products in several product lines: Premium, All Natural, Stuff'd, Light, and No Sugar ice ream, plus frozen yogurt, and sherbet. They also make frozen novelties, like ice cream sandwiches, sundae cones, and ice cream cake. I tried only the ice cream (specifically, the All Natural), at an ice cream social, where the host picked Turkey Hill. I was pleasantly surprised. "Turkey Hill All Natural Ice Cream is churned with all natural ingredients and a little extra cream for unforgettable richness." All Natural is actually Turkey Hill's base ice cream line. If you want higher quality or more fun flavors, go for the Premium line. If you want healthier, go for Light or No Sugar Added. And if you want decadent, Stuff'd is the flavors loaded with nuts, candies, and more. The All Natural line has 20 flavors, basically, the standards you'd expect, although there are a few fun ones in the lineup, like Blueberry. Not many mix-ins though, for those, you need to go Premium. I tried 3 of the All Natural selections, and they were better than I expected. "Cream, milk, sugar, salted caramel, vanilla." First up, trendy (well, a few years ago), Salted Caramel. I was expecting a tan ice cream, with a homogeneous salted caramel flavor. I am not sure why exactly, I guess just because that is what most salted caramel ice cream is, like, SF darling Bi-Rite, etc? Instead, this was a vanilla (?) base with swirls of caramel throughout. 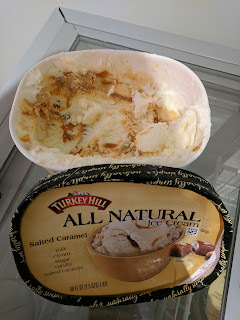 The caramel was sweet, the swirl generous, but I didn't really taste salt, and this just wasn't I was expecting at all given the flavor name (to be fair, it did match the image on the front of the container). Overall, fine, but not what I thought I was going for. "Milk, cream, sugar, cocoa, creamy peanut butter." Next up, Chocolate Peanut Butter. This was a great flavor. Well, if you like peanut butter. Which I do. A lot. I don't normally pick chocolate ice creams, but this had such a thick ribbon of peanut butter that it was irresistible. The peanut butter was thick, creamy, and, well, peanut butter-y. It tasted like a peanut butter cup, and I loved it. Having a half gallon of this in my house would be dangerous. I don't think it would last two sittings. "Cream, milk, sugar, chocolate chips, peppermint." And finally, for completeness, I tried the Mint Chocolate Chip. This was pretty classic mint chocolate chip ice cream. Decent mint level in the base ice cream, large chips of dark chocolate. Nothing to complain about. Good execution of a classic. As you know, I waffle a lot of leftovers. (Wait, you didn't know that? Go read my master post, and then return here. 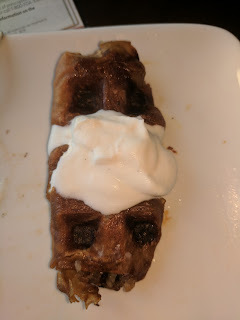 I'm not going to bore my regular readers with my preamble about waffling leftovers). While I waffle everything from fresh figs, to mashed taro, to pizza, to tuna noodle casserole, and just about everything in-between, desserts are a category I waffle less frequently than others. Which, is interesting really, given that actual waffles are generally rather dessert-like, and, uh I eat a lot of dessert. 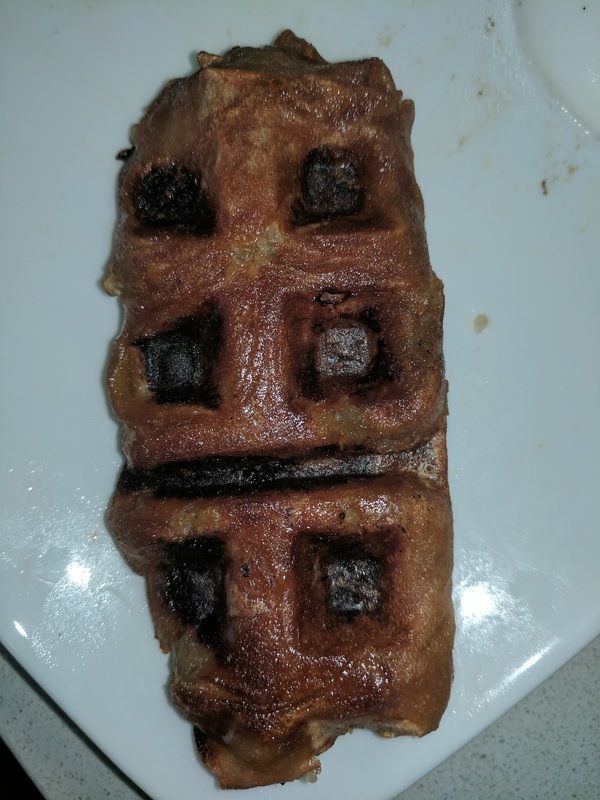 I guess most desserts just don't last long enough to waffle when I'm around. Anyway, this time, I went for dessert. Filipino dessert. Turon. You can also call it banana lumpia. Or turrón de banana. Or turrón de plátano. Or lumpiyang saging. Call it whatever you want. I'll go with turon since it is the shortest. 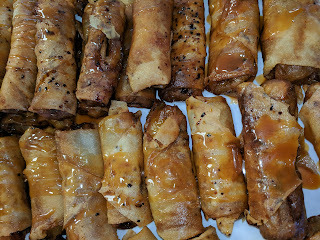 It is a Philippine street food, usually a deep fried spring roll filled with sliced bananas and jackfruit, although more adventurous filling like sweet potato, mango, coconut, and cheddar cheese can also join the fun. Turon Transformation: Original -> Leftovers -> Waffle! We had a special Filipino dinner at my office, with turon as the final course. It was fantastic when fresh, but, this was not an item that held up well at all. Which I knew. Yet I still saved one. For science. Or, er, you, my dear readers. 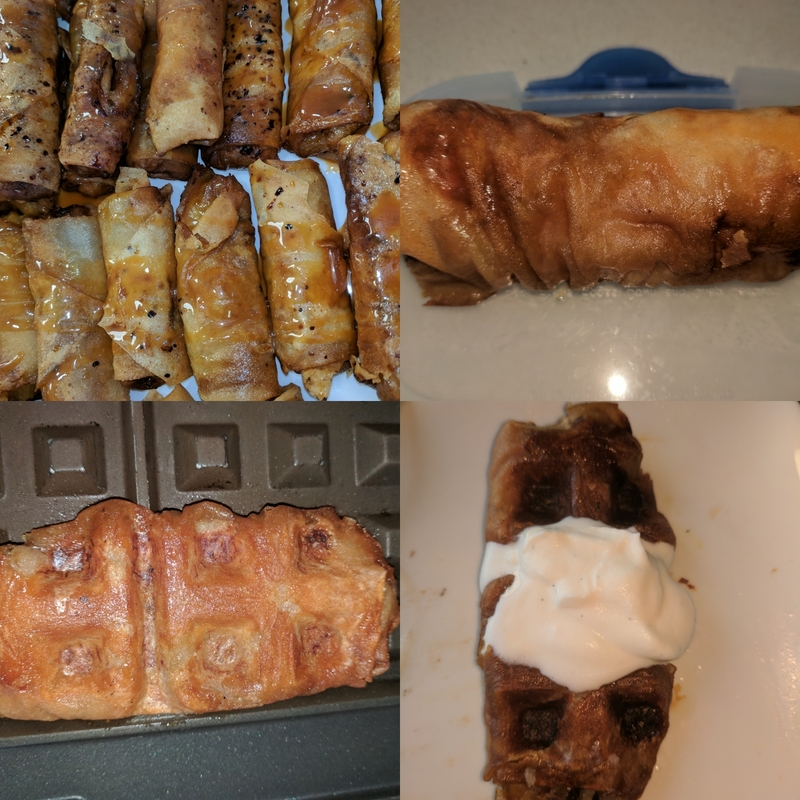 Leftover Turon: Will it Waffle? YES! This one goes firmly in the success bucket, and was one of my biggest salvations to date, taking something that was basically soggy and gross into something wonderful. The Original: Fresh Fried Turon with Coconut Caramel. The original was fantastic, made only with banana inside, and drizzled with coconut caramel. It was served fresh out of the fryer, nice and warm. 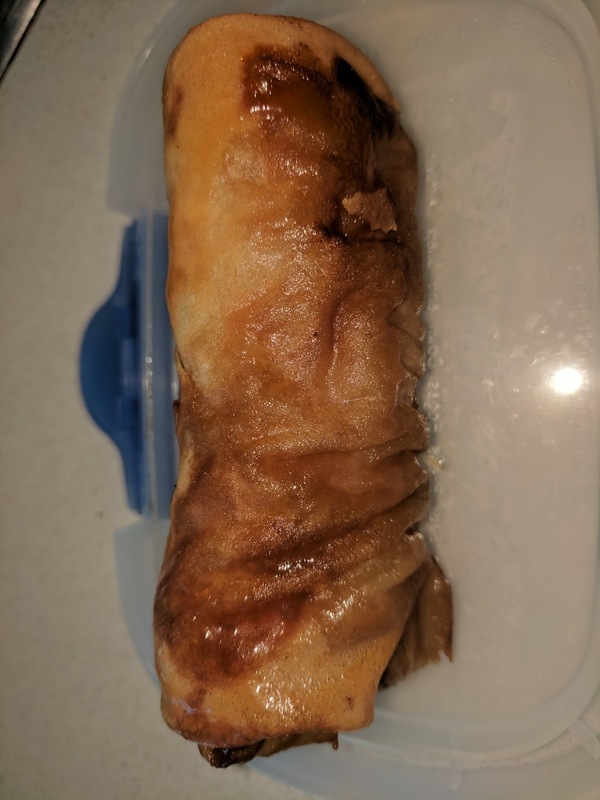 The exterior was a crispy spring roll wrapper, inside was a sweet warm mushy banana, and it had absolutely decadent coconut caramel drizzled over it. I dunked the first one in plenty of caramel, couldn't resist returning for another, which I dunked into whipped cream too, but, it didn't actually need any of these additions. Hot and fresh, this was glorious. The leftovers however, were not glorious. A fried spring roll wrapper does not hold up, particularly when it was drizzled with caramel already. The leftovers were extremely soggy. The wrapper was shriveled and soggy. It was incredibly unappealing. I tried a bite of one, and my suspicions were confirmed. This was not tasty. The banana inside was now hard and brown, and the wrapper, yeah. I tried heating it up in the toaster oven, which made things a bit better, but, barely. I had only one choice of what to do with the next one. Into the waffle iron it went. I didn't bother scrape the caramel off, I knew that would caramelized up on the outside again, and make it even crispier. I didn't crust it or do anything. Just stuck it in, mushed down the lid. 350° was my setting of choice, fairly arbitrary, but generally my default unless I know I need to sear. I checked on it a few minutes in, and things looked good. 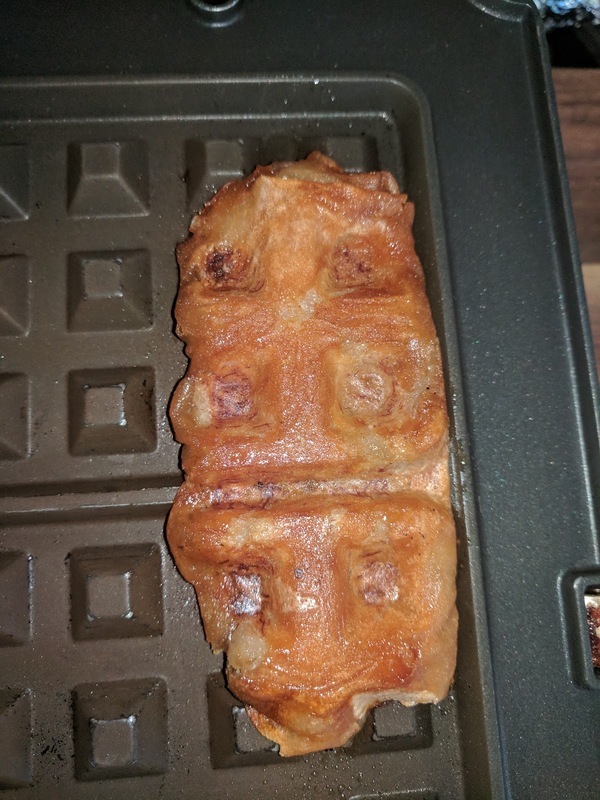 It even looked like a waffle. It extracted with no problem. It would have been fine to eat it like this (which, of course I did sneak a bite). But I wanted to do more. I topped it with whipped cream. Because I could. Because whipped cream makes everything better. Was it necessary? Nah. And did I later add ice cream too? Yup. Keep reading. The exterior was crispy from both the spring roll that re-crisped, and the caramel. As I hoped, the caramel melted off, pooled up in the waffle grills, and then redistributed itself onto it, and crisped up as it cooled slightly. Very successful exterior, and impressive even to me after all this waffling, to see something transform from soggy grossness into crispy goodness. Inside was now soft, molten, mushy banana again. Who cares that it was brown? It reminded me of deep fried bananas. Which, I always have with ice cream. So I added a scoop of vanilla ice cream too. ZOMG. Crispy exterior, fried goodness, sweet soft banana, contrasting hot and cold, crispy and creamy ... it was fantastic. Anyway, back to Farley's. Many consider it one of the first “third-wave” coffeehouses. They feature De La Paz coffee, baked goods from Starter Bakery (a VERY import detail), and ice cream from Three Twins. I think they also serve sandwiches and salads, but those items are rarely what I'm seeking out. They also have two locations in Oakland that I believe are bigger than the SF outpost. 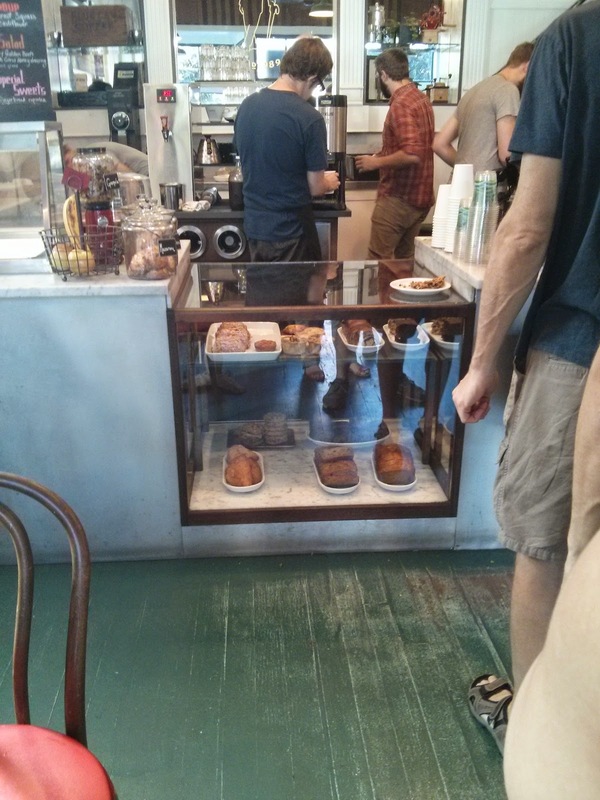 Besides the quality sourcing, Farley's is no cookie-cutter coffee shop. There are a number of unique aspects to it. The first striking thing about Farley's is the parket outside. 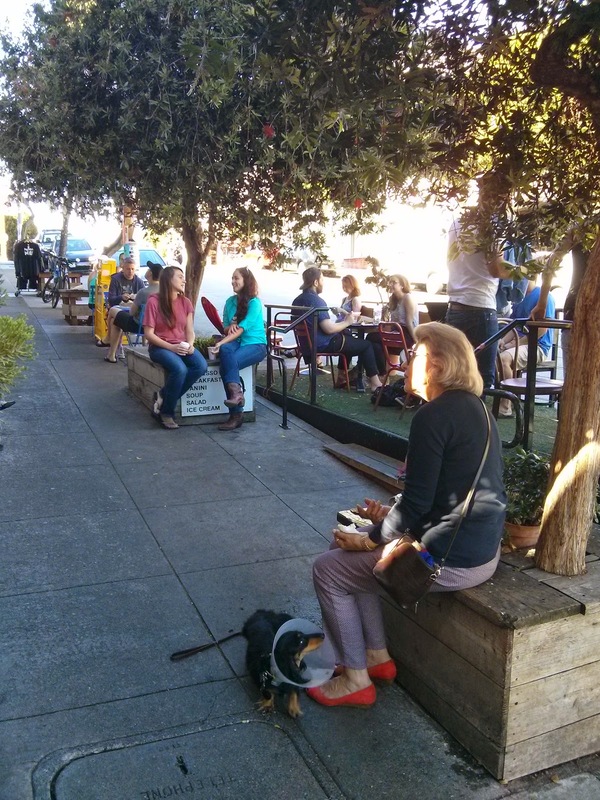 I read that one of their Oakland locations also has a parklet, the first one to be built in Oakland. The fake turf area has real tables and chairs, and seemingly even table service, but is quite small, and was full the entire time I was there. Others, myself included, just found places to perch elsewhere, on the planter boxes, on little benches. A very vibrant scene, and, the most interesting thing to me was the diversity of clientele. Young and old, some friends catching up over coffee, others having business meetings, plenty just out with their dogs. So many dogs. 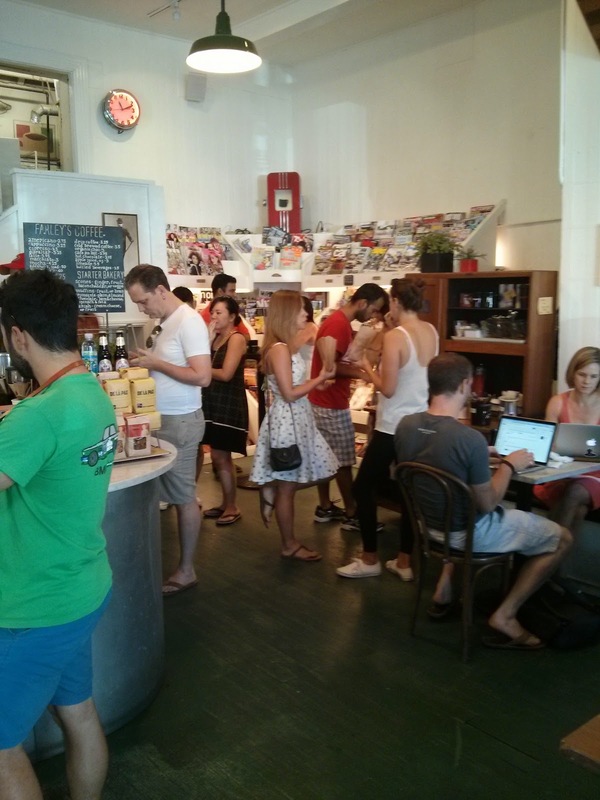 The inside area includes more tables, again, fully occupied, with most patrons working away on their laptops. Free wifi certainly encouraged this behavior. I don't normally review bathrooms, but, uh, this one was unique. First, to get to it, you had to go up some stairs, through an area that looked like customers shouldn't be wandering, past a water heater, and finally up another small set of stairs. 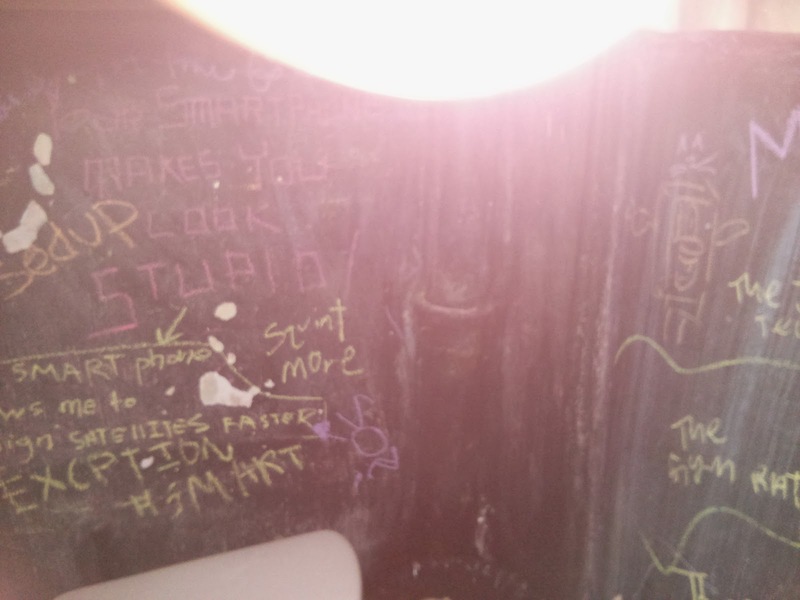 The walls were all covered in blackboard, and there was a bucket of chalk provided to decorate. And decorate people did. But the reason I was at Farley's was not for the ambiance, nor the coffee even. It was for the baked goods, because I know they order their baked goods from Starter Bakery, and Starter Bakery is GOOD. Starter Bakery is also located in Oakland, so I haven't actually been to the bakery, but many cafes around San Francisco offer their items. I've reviewed Starter Bakery before when I covered the baked goods from Philz, including, the iconic kouign amann. On the day of my first visit, the pastry case wasn't exactly overflowing. There were no muffins, although the chalkboard sign listed fruit and bran muffins. Same with danishes, the promised cream cheese or fruit delights were no where to be seen. For scones, there were only ginger scones, although the sign informed me that they also carry bacon & cheddar, fruit, and veggie scones. Only almond croissants remained, although plain, chocolate, ham & cheese, and spinach & feta are normally available. There were a few quickbreads, cookies, brownies, and oats & fruit bars (which they had samples of too). A couple quiches and empanadas too. But none of this mattered, as they had one item, not listed on the sign anywhere, that caught my eye the moment I walked in. A single kouign-amann! The line was long, and I was prayed that no one else would claim it. A famed Starter Bakery kouign-amann! The first time I had one, I dubbed it, "one of the best pastries I've ever had". I needed another. is similar to a croissant—but so much more. The rich treat is made by rolling out and folding together layers upon layers of dough with salted butter and sugar, then baking it in a butter-and-sugar-lined pan, resulting in an incredibly rich, sweet-and-salty experience." First, if you have never had a kouign-amann, you should just drop everything you are doing and go get one. And then I'll scold you, as I told you the same thing when I reviewed the Kouign-Amann dessert at Clio in Boston (you should also go there, if you are ever in Boston, one of my top meals of 2013!) 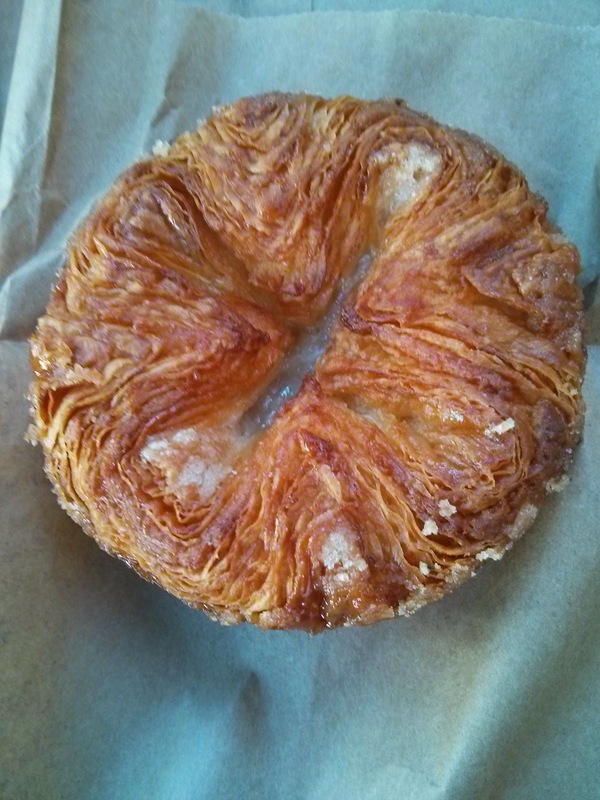 and when I reviewed my first Starter Bakery kouign-amann from Philz . Since I've reviewed the basics of a kouign-amann before, and Starter Bakery's specifically, I'll skip that this time around and just sum it up: when a kouign-amann is well prepared, it is a thing of wonder. And this one was. It was deeply caramelized and crispy on the outside. Yet flaky and delicate, composed of so many layers. Moist on the inside. The size isn't huge. It almost looks a bit petite even. But a few bites in, and you realize that even if you think you want it to be bigger, that would be a very, very bad idea. It is hard to resist just biting in and devouring the entire thing in a few bites, but, I do love pulling it apart, layer by layer. Seriously, kouign-amann is one of the very best pastries out there, and, I eat a LOT of pastries! The price was $4.25, which seems a bit steep, but, I know they are labor intensive. If you get one from Starter Bakery directly they are $4.